Iranian Activists Call for Arrest of Ahmadinejad Today at the UN! ** Iranian activists are demanding the arrest of President Mahmoud Ahmadinejad for the violation of human rights in Iran! Iranian activist Homa Arjomand called a Press Conference at Queen’s Park, Toronto, on Monday September 18, at 2:00 pm. 5,000 Iranian activists are expected at the UN today! The rally at Ontario’s legislature to mark their departure heard from a dozen Iranian activists, many of whom shared gruesome stories of torture in Iran’s prisons. The former teacher, who changed her last name over fears her activism could spark reprisal against her parents still in Iran, said many victims of such torture have since attempted suicide. 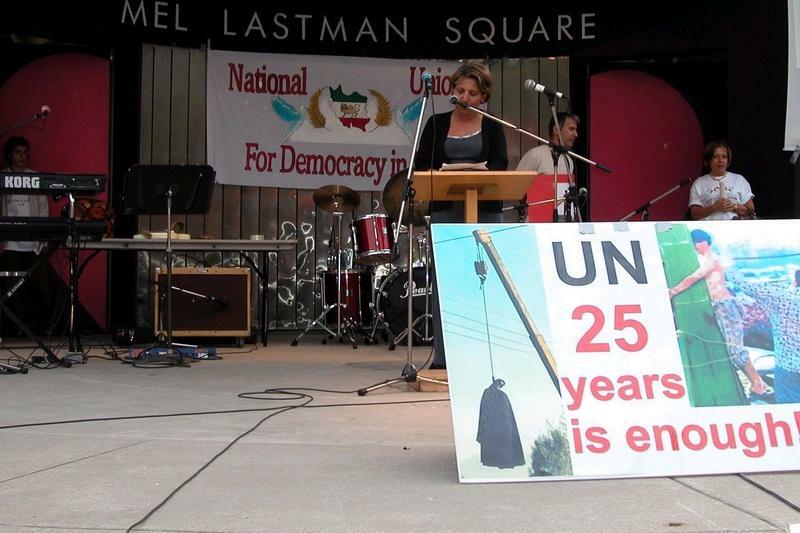 Homa Arjomand, Coordinator of the International Campaign Against Sharia Court in Canada, called a press conference where she and other Iranian activists demanded the arrest of President Ahmadinejad for crimes against humanity. “We declare that President Ahmadinejad has violated Articles 9, 10, 11 and 19 of the Universal Declaration of Human Rights.”, said Homa Arjomand. “We therefore call on the United Nations to arrest President Ahmadinejad for violating human rights in Iran”. The protestors claim President Ahmadinejad is responsible for the assassinations and executions of tens of Iranian activists both in Iran and abroad. “It is a disgrace to the United Nations to permit this man, with his record on human rights, the privilege to speak at this assembly, especially when he has taken the same rights from people in Iran and in tens of cases he has also taken their lives”, added Homa Arjomand. Iranian refugees and exiles living in Canada will gather at Queen’s Park in Toronto to demand that Canada extradite President Ahmadinejad and to have him stand trial in Canada for the death of Canadian photographer, Zahara Kazemi. An open microphone will also be available for other Iranians attending the protest. They will be able to tell their personal stories and to expose the crimes and human rights abuses of this Iranian regime and the leading terrorist – President Ahmadinejad. Hundreds of activists from Canada will join several thousands Iranians protesting at the United Nations to demand the arrest of President Ahmadinejad today. 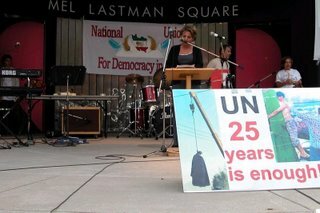 After the press conference on Monday, Homa and several hundreds of Canadians set off to New York City to protest at the United Nation where they will demand the arrest of the Iranian President Ahmadinejad. More: “We have three buses going to New York, as well many cars and minivans, said Homa, “please contact us if you want to join the protest of this terrorist from Iran”. Homa Arjomand is the Coordinator of the International Campaign Against Sharia Court in Canada. She started her campaign in Toronto in October 2003 with a handful of supporters, and today it has grown to a coalition of 87 organizations from 14 countries with over a thousand activists. In February 2006, the Ontario Government passed legislation which ended the use of religious laws for family arbitration. Since then, the Campaign has focused its efforts on stopping political Islam globally. Homa is now Coordinator of a campaign called “No to political Islam” and was a human rights activist in Iran until she was forced to flee in 1989. Things are getting ugly. Even Iranian Leftists are attacking Chavez for his cooperation with Ahmadinejad. Oh… and there are riots in Northern Iran!